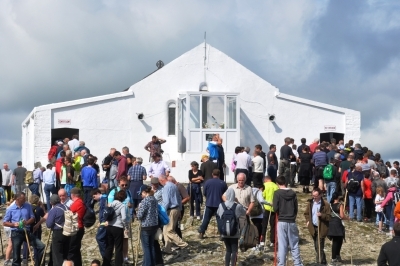 Reek Sunday, the last Sunday in July, sees several thousand people climb Croagh Patrick on the southern shore of Clew Bay in Mayo. The sheer scale of the event and its links with the ancient and more modern past, mark it out as one of the most distinct events in Ireland. It is a combination of a variety of elements, including the Celtic feast of Lughnasa, Patrician lore, spiritual devotion, personal and familial tradition and the sense of an event. For a historical overview of Croagh Patrick, checkout the post from Pilgrimage in Medieval Ireland. 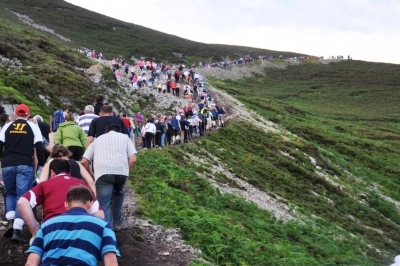 Although Croagh Patrick is climbed throughout the year, Reek Sunday is a special day. People from all over Ireland travel especially on that day. You are guaranteed to encounter all manner of humanity here. It is also on this day that some of the more religious or spiritual elements come to the fore. My fieldwork involved me engaging with the events, people and landscape of Croagh Patrick throughout Reek Sunday. I started off about 6am walking; however, I made frequent stops to photograph and record events. I spent a few hours on the summit taking everything in and talking to some people and, then, descended slowly, arriving down by 4pm. This video is an amalgamation of different recordings I made throughout the day. It attempts to give a sense of the movements, sounds and moments that make up the pilgrimage. One of the most striking aspects of the day is the significant numbers who are climbing at an early hour. While some people still practice the traditional night pilgrimage, the main crowds start arriving from about dawn. When I was walking up after 6am, there were at least several thousand people on the Reek. While most of the world rests on this Sunday morning, the approaching roads, fields being used as car parks and the paths are alive with activity. In a previous post, I have outlined the route and character of the main path leading up from Murrisk. Pilgrims pass the statue of St Patrick as they begin their ascent, just after dawn. A long trail of pilgrims ascending to the main ridge at about 6.20 am. Pilgrims climbing Casán Phádraig, the path leading up the Reek proper, early in the morning. St Patrick’s Chapel on the summit, just after one of the masses (one every half hour between 8am & 2pm). Pilgrims on the left are queueing for Confessions and those on the right for Communion. A recording of the gospel (The Beatitudes formthe Sermon on the Mount, Matthew 5:3–12) at the 9.30am mass, read by Archbishop Charles John Brown, Apostolic Nuncio to Ireland. A pilgrim rounding the chapel with their rosary beads. The congregation at mass are in the background. Leaba Phádraig: A number of pilgrims follow the traditional stations of the route by rounding St Patrick’s Bed reciting prayers. Going down, which is often seen as being more challenging, involves steady footing and heavy use of the stick almost as a third foot. The mountain is known for the camaraderie it encourages in people. Those descending continually assure those coming up that there almost there, some giving slightly unrealistic estimations, possible to bolster confidence and determination. Furthermore, these seems to have been a perennial characteristic of Croagh Patrick with one 1910 commentator, known only as E O’L. writing in The Irish Monthly saying that such assurances were “well calculated to cheer and revive the drooping spirits, such as ” Bravo ! you’re getting on grand, you have only a few hundred yards more to climb,”…” (p.592). Descending the Casán: going down the steep path on uncertain surfaces is often considered to be the most challening aspect. 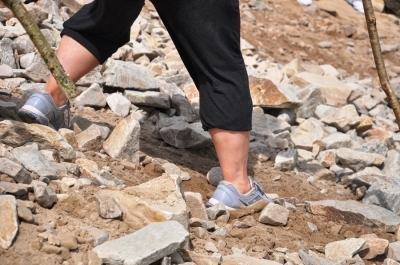 Here the feet, the means by which the pilgrim engages physically with the mountain, are adjusting to the incline. The Reek proper in the early afternoon, the steady flow of pilgrims are evident, animating the path all the way up the peak. Numerous groups and business set up stalls at the base of the path in Murrisk. While, some are promotion particular causes or denominations, others are selling religious items or food. This was my second Reek Sunday (both being motivated by my research), but I’ve already grown fond of the day. It has a distinct feel to it and I can understand some of what draws people back year after year. Also, the role played by groups such as volunteer first aiders, stewards, Gardaí, the Air Corps, clergy and local people should be acknowledged. Hughes, H., 2005. 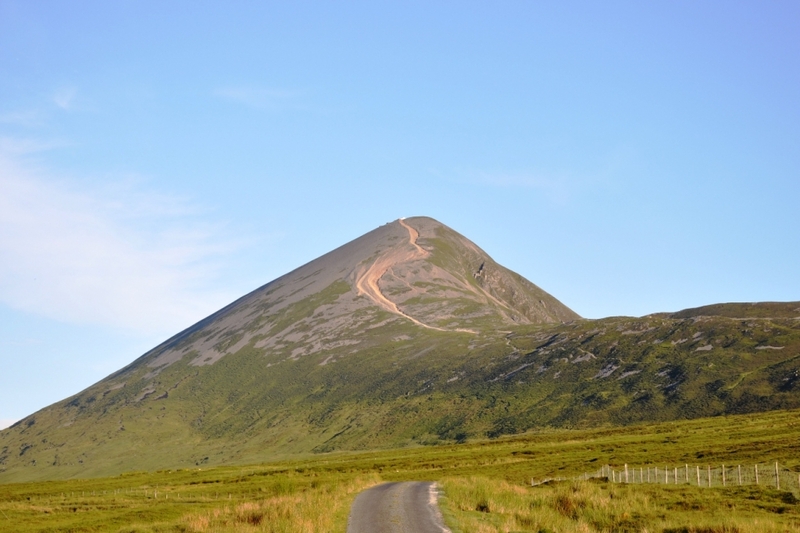 Croagh Patrick: Ireland’s Holy Mountain. The Croagh Patrick Archaeological Committee. Hughes, H., 2010. Croagh Patrick: a place of pilgrimage, a place of beauty. O’Brien Pub. O’L., E., 1910. 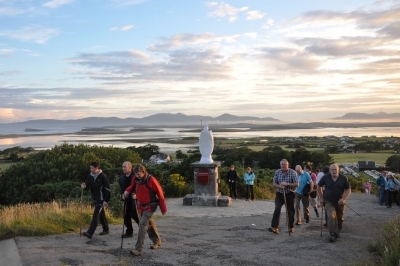 A Pilgrimage to Croagh Patrick: July 31, 1910. The Irish Monthly, 38(448), pp.585–596. Road to Emmaus staff, 2011. 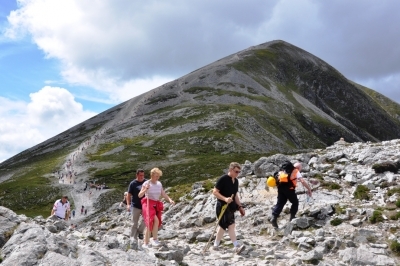 Croagh Patrick: The glorious climb of Ireland’s holy mountain. Road to Emmaus, 12(2), pp.1–45. 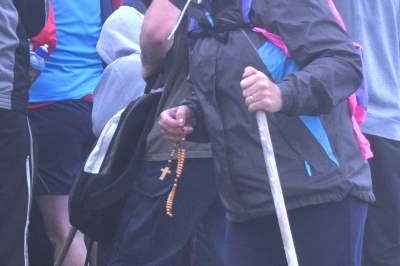 During May I participated in two pilgrimages on Croagh Patrick with different two groups. The first was with Pilgrimage Project, a collaborative project which was run in May 2013 and connected a group of Irish, Icelandic and Greek musicians, visual and performative artists. The second was with Tuam Diocesan Youth Council which aims to provide opportunities for young people to develop and nurture their faith. Both were very enjoyable days and presented different ways of considering and experiencing the Reek. The first offered more historic outlook which was attentive to the ancient origins and the role of mountains as locations of interaction with deities and the otherworldly. This pilgrimage centred on the ideals of a group of people coexisting, living and working together in exploration of cultural identity. The conversation, on the journey and in eating on the summit, touched on the landscape and links between island or peripheral places. 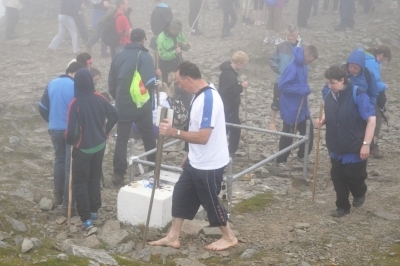 The second climb of Croagh Patrick was a religious pilgrimage. 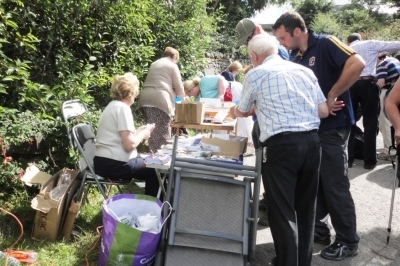 It was part of an annual calendar of events run by the Catholic Archdiocese of Tuam’s Youth Council. The event was designed to help young people explore and develop their faith. A strong wind made for a tough climb, while mass in the oratory was a pleasant communal experience. In both cases, I was lucky enough to participate in a larger group. This enabled me to walk along with others, share stories and get a chance to consider different forms of pilgrimage, which unfolded on the one site. As previously discussed, I use video as a method in my research. It serves both as a research tool and as a means of presenting my work. I have complied two short videos based on the two pilgrimages. The Pilgrimage Project video gives a sense of the journey of a group by locating it temporally, as well as giving the briefest interpretation to events. The Youth Pilgrimage video was formatted to capture a sense of the purpose of the event. It layers audio recordings from the mass onto the journey, linking the performance and meaning. This collection of images represents the main path on Croagh Patrick. Most people who climb the mountain do so along this route, which runs from Murrisk, with a car park and amenities, up the to main ridge, along a section of that ridge and then up the Reek proper. 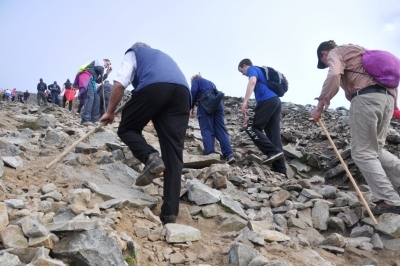 This path is what defines the Croagh Patrick experience for most people. Its uneven surface, its weaving up the ridge and its loose screen shape the climb. The devoted pilgrim, the curious tourist and eager hillwalker all engage with the same trail, each experiencing it in their own way. 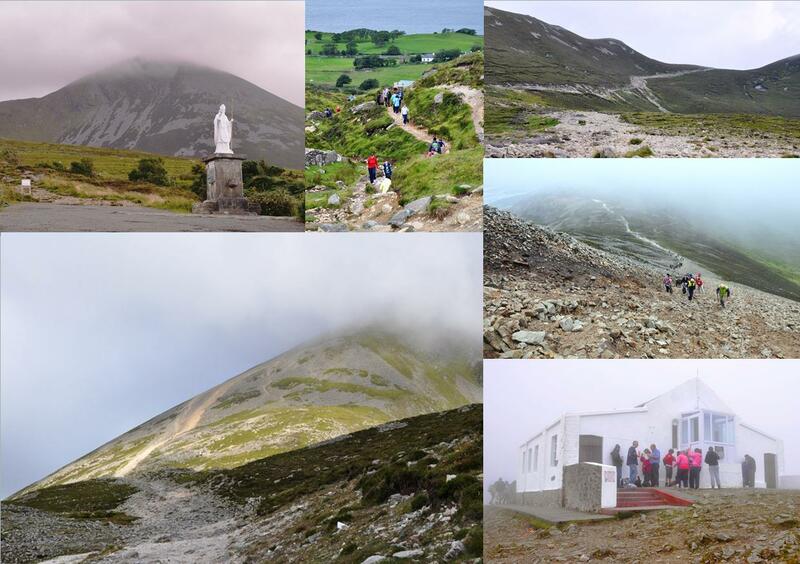 Photos, clockwise from top left-hand corner: the statue of St Patrick at the base of the mountain; walkers moving through a narrow gap in a small ridge shortly into the climb; the path weaving up the northern slope of the main ridge; looking down on Casán Phádraig (the path of St Patrick) with its steep incline and loose scree; a group of pilgrims eating and chatting in the shelter of the chapel on the summit; Casán Phádraig climbs up the scree on the side of the Reek. 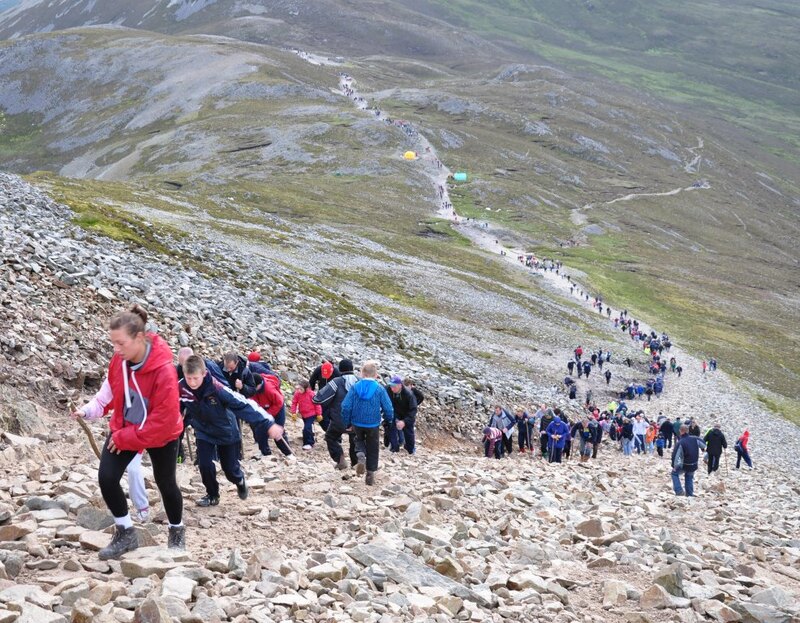 A photo showing people climbing Croagh Patrick on the annual pilgrimage day, Reek Sunday (the last Sunday in July). The photo looks eastward, down the path from a little way up the scree-covered peak and across the ridge, which the main path runs across. This section of path is known as Casán Phádraig, the path of St Patrick. The significant number of ‘pilgrims’ results in lines or flows of people, almost creating one continuous row going up the mountain. The large crowd animates the path itself. The erosion of the path, the relative smooth surface of the most walked-on section and the loose nature of the outer track are all evident. The mountain rescue/first aid tents are visible below in the middle ground.